Formafantasma is showcasing a series of lighting designs and experiments in Milan, including golden hoops that project circles of light and slender beams that create colourful refractions. On show at Spazio Krizia throughout Milan design week, Foundation brings together 16 different lighting pieces by the Amsterdam-based design duo, Andrea Trimarchi and Simone Farresin. It includes both old and new designs, and encompasses finished projects, study pieces and works in progress. According to Farresin, the aim is to give an insight into the pair's process: focusing on the lighting the pieces will create, rather than the forms of the lamps themselves. "We're showing different objects that investigate light from different perspectives," he told Dezeen at the exhibition opening. "There are elements that look at lighting objects, and others that look at colours, or relationships with shadows." Upon arriving, the first piece visitors see is Ellipse. Designed for the TextielMuseum in Tilburg, the Netherlands, it features a large disc covered in pale blue and gold fabric. "We really hate colourful lighting, when the room turns into a different colour," said Farresin. "But this was a way of adding colour without changing the colour of the light." Another recent design on show is Magnifiers, a series of suspended brass rings that create overlapping circles of light on the floor below. This effect was achieved by separating the LED light from the optics. 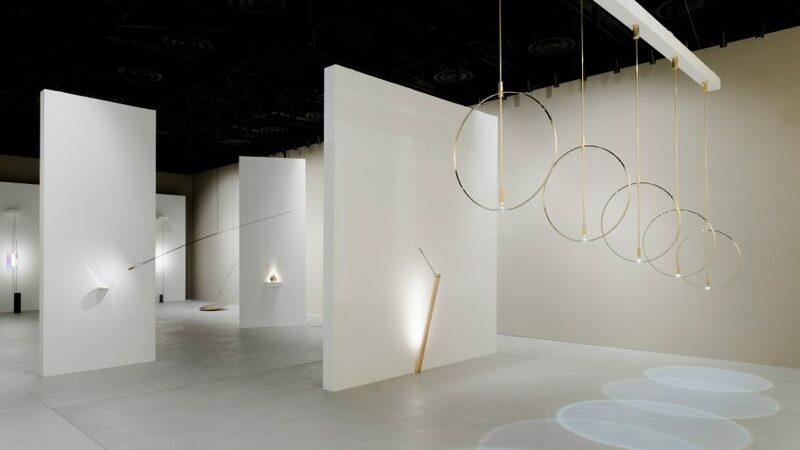 Other designs in the show include Colore, which naturally create flashes of colour; Eclisse, which looks like a solar eclipse; and Elmetto, which is made from brass circles. Trimarchi and Farresin founded their studio after graduating from Design Academy Eindhoven in 2009. They ranked at number 132 in the inaugural Dezeen Hot List – a countdown of the most newsworthy names in architecture and design. Past projects include objects made from lava, unusual timepieces, and objects inspired by Rome's ancient ruins. This latest exhibition is timed to coincide with the launch of two new lights, created by Formafantasma for Italian lighting brand Flos. They are being presented at the Salone del Mobile as part of Euroluce.